Knowledge discovery from infinite data streams is an important and difficult task. We are facing two challenges, the overwhelming volume and the concept drifts of the streaming data. 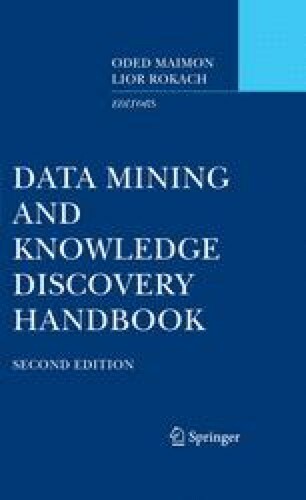 In this chapter, we introduce a general framework for mining concept-drifting data streams using weighted ensemble classifiers. We train an ensemble of classification models, such as C4.5, RIPPER, naive Bayesian, etc., from sequential chunks of the data stream. The classifiers in the ensemble are judiciously weighted based on their expected classification accuracy on the test data under the time-evolving environment. Thus, the ensemble approach improves both the efficiency in learning the model and the accuracy in performing classification. Our empirical study shows that the proposed methods have substantial advantage over single-classifier approaches in prediction accuracy, and the ensemble framework is effective for a variety of classification models. We thank Wei Fan of IBM T. J. Watson Research Center for providing us with a revised version of the C4.5 decision tree classifier and running some experiments.